Daniel Ricciardo has managed to showcase some of the trademark Aussie larrikinism that has underpinned his popularity in F1 amid an unsatisfying end to his final race with Red Bull. After leading the Abu Dhabi Grand Prix for 15 laps on Monday the Australian, who will link with Renault next season, was forced to pit on lap 34 which saw him return to the track in fifth position, before crossing the narrowly off podium in fourth. While not the finish he would have hoped for, it’s a fitting end to a largely frustrating season that has seen his clinical driving dashed by incessant mechanical failure. And Ricciardo decided to let his Red Bull engineer Simon Rennie know how he really felt when he thanked him for his five years of service. “You’re a d---head,” Riccardo’s on-board radio caught him hilariously digging at Rennie. The Australian has a deep-seated respect for Rennie in his time with Red Bull which he delved into in an emotional blod post ahead of his final race with the outfit. 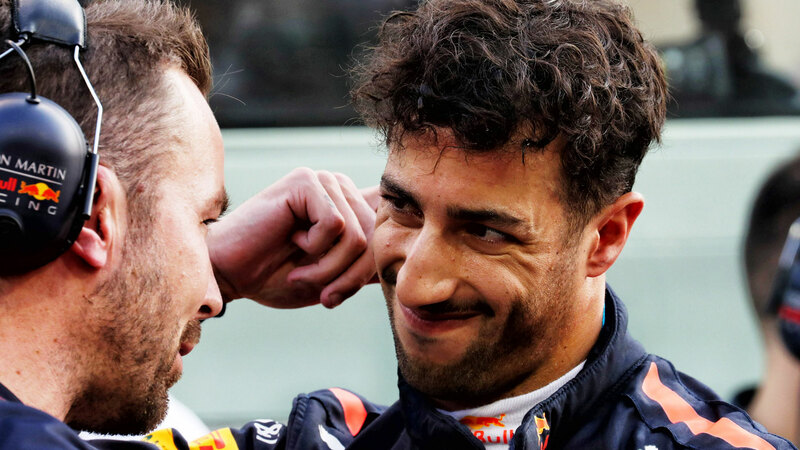 “Simon and I couldn’t be more different out of the car, our personalities are really as contrasting as you could get, but we’ve had this fantastic relationship where he understands me and we never second-guess one another,” Ricciardo wrote. “I always felt he knew what I wanted or what I meant, and I always trusted him to make the right calls. I never questioned him. Ricciardo will look toward a fresh start as he joins Renault for the 2019 Formula one season.